The CSC Group is a name to reckon with. Our core values of transparency, integrity, commitment, quality and customer satisfaction form the strong base of our company. We are now foraying into a full length construction business and envision a dream of providing every family in the country with unsurpassed, competitive and economically priced housing. Our team comprises of young & professionally skilled employees who dedicate their work towards overseeing all aspects of real estate. We at CSC look for innovative ways to reduce construction costs without compromising on the quality of housing. CSC aims to raise the bar in the industry by providing innovative concepts, new technologies, methods, design paradigms and better ways of improving the sheer experience of life in every project we undertake. And that’s the confidence we offer every single one of our associates, customers and clients. We create what inspires you"
CSC Homes is a residential complex with amenities like swimming pool, jogging park, club house, indoor games, gym, party hall, 24 hrs security, kids play area, STP & WTP, crèche, standby power back up, rain water harvesting, super market/shops, hospice centre, etc. With a vision to popularize this concept of “CSC Homes”, CSC has launched Belva at Hosur, Sarjapur Road. Step into a dreamy expanse of beautiful view and tranquility providing infinite possibilities for comfortable living. Where leisure is not just an occasional indulgence; it's a way of life. CSC Belva (means ‘Beautiful view’), is not just a great place to live in; it's also great value. Value that is driven by our expertise, our quality and our commitment to deliver on time. After all, life is all about promises! Homes at CSC Belva, designed with the underlying aspects that have become the signature features of all homes by CSC Group (maximum utilization of space, the focus on all-around privacy and natural light & ventilation), embody a refreshingly contemporary way of life. The real estate value that comes with the ideal location advantage (something that every land developer and home owner dreams of) is something that will continue to grow on you. CSC Belva is located very close to Sarjapur Road, on the IT corridor between Whitefield and Electronic City. Tucked away amidst soothing greenery but still accessible by the Outer Ring Road, it's just a short drive away from the multiplexes, shopping malls & commercial establishments in the city and also strategically close to the current IT hubs of Bangalore. Belva’ means beautiful view and that is evident here. With lush greenery and serene beauty all around...no wonder it is rightly called ‘CSC Belva’. 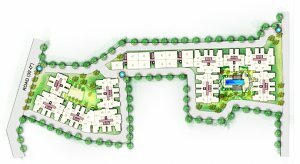 2-BHK (592 sft to 820 sft) & 3-BHK units (1000 sft and above). This project is designed with great emphasis on functional aspects to make your day to day lifestyle as comfortable as possible.